Chinese biomedical scientists brushed off accusations in the US that China's leap in animal science research is based on lower animal welfare standards and fewer ethical limits. China's progress in this field is feuled by its great focus and significant investment of resources, they say. One of the areas is animal cloning. The world's first cloned primates are doing well. "Zhong Zhong and Hua Hua are in good condition. Their physical situation and cognitive behavior are no different from ordinary monkeys," Poo Mu-ming, director of the Institute of Neuroscience with the Chinese Academy of Sciences (CAS), told the Global Times on Wednesday. In January, scientists from the non-human-primate research facility under CAS announced that they had successfully cloned two cynomolgus monkeys, becoming the world's first primates cloned using the method that created Dolly the sheep. The macaques were named Zhong Zhong and Hua Hua. Characters in their names come from "Zhonghua," meaning the Chinese nation. The breakthrough stunned the world, with wide media coverage hailing it as breaking new ground in primate research and a new step for China to realize its ambitious goal of becoming a technology superpower. The cloning technology has been used in many mammals but its application in primates - a family which includes human beings - had long been an unresolved puzzle. Overseas media expressed concerns over whether strict ethical limits in the US may allow researchers in China to pull ahead in the field. However, Chinese scientists argued that their primary goal is to advance the development of medicine for curing human diseases. China is establishing itself as an international hub of primate research and has invested heavily in this field. Many projects have been set up in recent years such as a key development project under the Ministry of Science and Technology, CAS's Hundred Talents Program and the National Natural Science Foundation. With the support of the Shanghai government, Poo and his team launched a brain science research park to promote the industrialization of the technology, focusing on research into primate disease models, neurological intelligence technologies and developing medicine. According to previous reports, the park may draw over 10 billion yuan ($1.5 billion) of investment. Meanwhile, another laboratory dedicated to improving human health through excellence in non-human primate studies was also established in 2011 in Kunming, Yunnan Province. In early 2014, the laboratory achieved precise gene modification in monkeys for the first time, a milestone for precision gene editing of primate disease models. 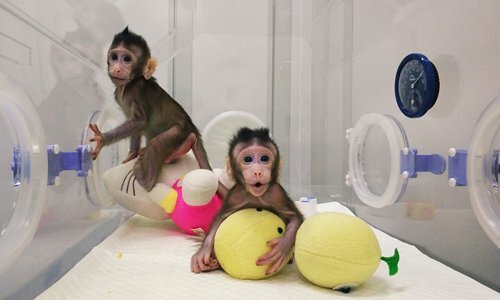 Ming Ming and Ning Ning, two genetically modified monkeys in the Kunming lab, were created with technology that can cut-and-paste DNA in living organisms. The breakthrough could help battle diseases such as Alzheimer's and Parkinson's. The momentum of development in primate research has also attracted scientific talent from overseas, especially several Nobel Prize winners. Poo was the first director with a foreign nationality in CAS's history. He later gave up his American citizenship and recovered his Chinese nationality. All this progress was met with questions over the ethics of animal testing from overseas media. An article in the Atlantic Magazine wrote that the strict ethical limits in the US might allow researchers elsewhere in the world, like China, to outpace researchers in the US. The article claimed ethical limits led the US to have pulled back in primate research, but China's animal-rights movement has largely focused on the welfare of pets. However, Xiong Zhiqi, an expert from CAS's Institute of Neuroscience, argued that it is not a matter of ethical limits. "The US has entered a bottleneck in primate research. China has a great potential in leading the field because of the country's increasing support, not because the US is compromising to ethical concerns," Xiong told the Global Times. Ji Weizhi, director of the Yunnan Key Laboratory of Primate Biomedical Research, told the Global Times that the US experiments on 70,000 monkeys annually since 2010, which is several times more than in China. "Ethics should not be a reason that hinders scientific development," he stressed. According to Ji, China has followed strict ethical standards such as using other animals to replace primates and reducing the number of primates experimented on as much as they can. "The cloned monkey technology will largely reduce the number of monkeys needed for experiments as it could produce monkeys with the same genetic backgrounds," Poo said. Combining cloned monkeys with the new gene-editing techniques could help hasten the speed of producing more primate disease models, Xiong said. Meanwhile, China's abundant clinical resources will help the country thrive in primate research, Xiong added.